Home JPG Blog Happy International Women’s Day! Today is International Women’s Day. 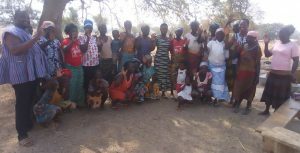 On this special day, Youth Harvest Foundation Ghana (YHFG) in Bolgatanga interacted with some of its programme beneficiaries (women groups) in Bongo district, encouraging them to continue pushing the agenda of fighting for women’s rights in their communities and beyond. The YHFG, in cooperation with JugendPartnerschaft Ghana (JPG), initiated various projects in the past years to support girls and women, and to fight for their rights. One of the projects is the Girls’ Remedial School, where girls who failed their senior high school exams got remedial classes, books and shelter to prepare for their re-examination. Particularly for girls it can be difficult to complete senior high school successfully, because parents do not have financial means to support them, or they become victims of early marriage (read more about this project).